Over the course of the last week I have encountered the name Alexis Carrel in two wildly different contexts, neither of them good. Coverage of the recent story about stem cell research fraud goes out of the way to call out Carrel for his claim of growing chicken cells indefinitely. Notably influential on the Islamists has been Catholic fascism in its French version—namely, the Catholic monarchism of the Vichy scientist Alexis Carrel, who dreamed of restoring the medieval grandeurs. (Meanwhile he advocated gas chambers as a way of getting rid of inferior people—even as he worked at Rockefeller University in New York!) To abolish modern alienation was precisely Carrel’s concern. 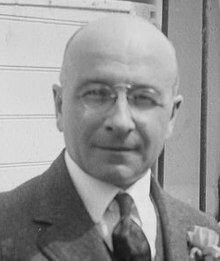 The man in the middle of it all was Alexis Carrel, a brilliant and rather dapper Frenchman working at the Rockefeller Institute in New York. Carrel discovered that, if you remove some cells from the body, sit them in a nutritious broth and handle them correctly, they can not only survive, but thrive and multiply. Also, if you take some cells from one culture, you can start a new one and, with that, a third, and so on. The importance of this technique – know as cell “passaging” – can’t be overstated. With it, Carrel literally opened a new era in cell research. Unfortunately, he did so with an experiment that, while earning him international superstardom, proved to be a complete and utter train wreck. So Carrel is responsible for introducing Rene Dubos to Oswald Avery and therefore, to the extent that wise recruitment counts, can claim to have brought antibiotic discovery to The Rockefeller University. Carrel was also a nobel laureate whose award was given “in recognition of his work on vascular suture and the transplantation of blood vessels and organs” and whose subsequent work on cell culture led to the controversy in the above article. His Nobel bio says he joined the French Army in (1914-1919) and developed a chlorine-based antiseptic for treating wounds.Theres not much about the time between 1919 and 1939 when he accepted a position with the French Ministry of Health, and ended up staying in France and running an Institute of Health set up by the Vichy Government. I am finding it intriguing to imagine that Carrel and Loeb could a) work well together and b) not have come to loggerheads. It would be interesting to see whether the views that Carrel held later in life - devout Catholicism, proactive eugenicist - were already awake during these early Rockefeller years (~1912) and whether these views were held secret. I think its time for a little more background reading.